With so many dog breeders its very easy to find a Yorkshire Terrier, but to find a healthy one that represents the breed the way it should, you should choose your Yorkie breeder carefully. To do this, you will have to be able to tell a good Yorkshire Terrier from a bad Yorkshire Terrier, also you will have to be able to tell a good breeder from a average breeder. We all want a great looking healthy pet. Looks and certainly health is vital and partly heritable. No breeder can ensure a dog will live a lengthy and healthy life, but you can undoubtedly increase the likelihood of this by choosing a good breeder. 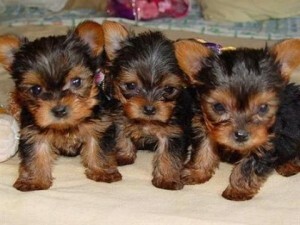 Ask about your Yorkie puppies pedigree which would include your puppies ancestors. With yorkshire terriers there seems to be conditions that they are predisposed to Legg-Calve-Perthes, patellar luxation, portosystemic shunts, tracheal collapse and bladder stones. Preferred breeders have their dogs tested for these conditions before breeding them. No line of dogs is perfect, so dont ignore a line with some problems further back, besides a lot of breeders may not be as honest in disclosing problems. Lets not forget about the importance of good disposition. You want a Yorkie Puppie because of the devoted and very confident, self assurance they posses, which is part of what makes them such a great companion. Extremely shy Yorkies may come for genetically shy stock or from socially isolated environments, both of which can make them more challenging to form into confident adults. Yorkie puppies from parents with excellent temperaments and a outgoing personality increases the fact that your Yorkie puppy with also have these traits. Also look for how much time is spent on puppy socialization from the yorkies puppies breeder. And last but surely not at all least is looks! Part of the attraction of the Yorkie is the little size, glorious coat, intriguing color, and alluring expression on such an adorable face. Show breeders concerned with breeding for conformation competition are the most likely to produce Yorkie puppies with the appearance that drew you to the breed! Examine your potential Yorkie puppies pedigree to check to be sure that close relatives have confirmation championships from AKC (American Kennel Club). The closer these relatives with AKC championships are to your puppy the better (the closest being the puppy’s sire and dam). Get to know the Yorkshire Terrier standard and look up AKC champion Yorkies online to look at them. Show exhibitor breeders always have pet quality puppies available that are not quite show quality, but nonetheless are often so close to being show quality that only an expert could tell. Such dogs have the advantage of being raised with the best of knowledge and care as far as yorkie breeders along with great looks.